Emvantage is a startup founded in 2012. Its platform includes a payment gateway in India for online transactions made via credit and debit cards and prepaid wallets. It also provides mobile payment tools that integrate into merchant apps and facilitate net banking. The purchase will let Amazon integrate its current Indian web portal with the Emvantage payment system. That should make it easier for consumers to make online transactions in the country. Many shoppers in India pay for e-commerce purchases using pre-paid cards and online wallets. Ease of use is crucial in India's rapidly growing e-commerce business. The country's e-commerce market is projected to surpass the $100 billion mark by 2020, according to a recent report by Goldman Sachs. The payment market in India is burgeoning thanks to growing Internet availability, increased smartphone ownership, digital wallet adoption, and better execution of online purchases. According to the World Bank's latest forecast, India will be the world's fastest growing economy this year as China slows. India's output in 2016 is forecast at 7.7%. That's a full percentage point higher than China, the world's second-largest economy. Also driving India's enviable growth is heavy government spending on infrastructure and hefty business expansion spending. AMZN stock has been caught up in this year's global stock market rout. Yet at a recent price of $551.12, shares are still up more than 44% in the last year. Amazon stock was the top performer in the S&P 500 Index during 2015. Shares more than doubled last year, climbing 122% in 2015. 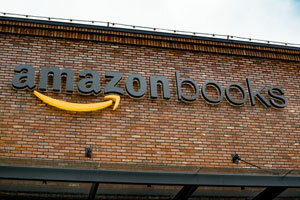 Driving the Amazon stock price was Prime membership, which offers two-day shipping for a $99 annual fee. Amazon just raised its free shipping minimum to $49 from $35. The move will encourage even more shoppers to join Prime. Amazon has become the one-stop, go-to retailer for customers wanting convenience, competitive prices, and quick delivery. It's come a long way from its original roots as an online bookstore. In fact, Amazon just landed at No. 3 on Fortune's recently released list of the world's most admired companies. "Analysts thought Amazon.com should stick to its knitting as an online store," Robinson said last month. "But what Bezos knew, and the Wall Street crowd missed, was something called the 'power of scale.'" Since that time, Bezos has turned Amazon into a retail powerhouse. In July 2015, Amazon surpassed Wal-Mart as the world's largest retailer by market value. Amazon is a leader in web services and cloud computing. It's a formidable competitor in the entertainment space thanks to its streaming business. And it's at the forefront of technology with ventures including delivery by drone and the Internet of Things (IoT). "Bezos has once again broken ground for another multibillion-dollar web business," Robinson said. AMZN stock may remain volatile in the short term because of the broader market's volatility, but for long-term investors, Bezos' vision for the company is encouraging. Is the income ordinary or capital gain?